With the growth in corn acreage in North Dakota, many producers are exploring harvest options that reduce cost or spread the harvest window. For livestock producers, harvesting corn as high-moisture grain is one option that will eliminate grain drying costs and produce a product that makes excellent feed for ruminant animals. High-moisture corn refers to corn harvested at 24 percent or greater moisture, stored and allowed to ferment in a silo or other storage structure, and used as feed for livestock. ■ High-moisture corn is similar in energy and protein content to dry corn. ■ No grain drying costs are encountered. ■ Yields typically are increased due to less ear drop in the field. ■ Longer-season (greater relative maturity) corn can be grown with greater yield potential. ■ High-moisture corn allows for an earlier corn harvest, avoiding difficulties associated with adverse weather and potentially spreading the workload during harvest. ■ Cattle have a longer window for grazing corn residue. ■ Marketing alternatives are limited. High-moisture corn is marketable only through livestock. Since it has fermented, high-moisture corn cannot be marketed for ethanol production or other uses typical for dry corn. ■ High-moisture corn may require additional storage and processing equipment. ■ Improperly ensiling high-moisture corn will result in excessive spoilage and storage losses. ■ High-moisture corn tends to ferment faster in the rumen and requires better bunk management, compared with dry corn. High-moisture corn should be harvested at 24 to 33 percent moisture for optimum storage (maximum moisture of 40 percent). Harvesting corn at these moisture levels may require adjustments to harvest equipment to ensure grain is removed from the cob uniformly. Some damage to the grain is acceptable because it still will need to be processed prior to ensiling. High-moisture corn should be processed (ground or rolled) prior to storage. Grinding or rolling and subsequent packing of the corn facilitates oxygen exclusion in the silo. The goal with processing should be to have no more than 5 percent fines and no more than 5 percent whole kernels. For feeding purposes, rolling is the preferred method of processing (compared with grinding) because rolling will result in less fines and lower probability of acidosis due to rapid fermentation when feeding. Photo 1 shows a high-capacity hammer mill specially designed for high-volume processing of high-moisture corn. High-moisture grain being processed with high-volume hammer mill for storage in a bunker silo (photo courtesy of Haybuster Inc.). Photo 2 shows a tub grinder adapted to grind corn into a bunker silo. 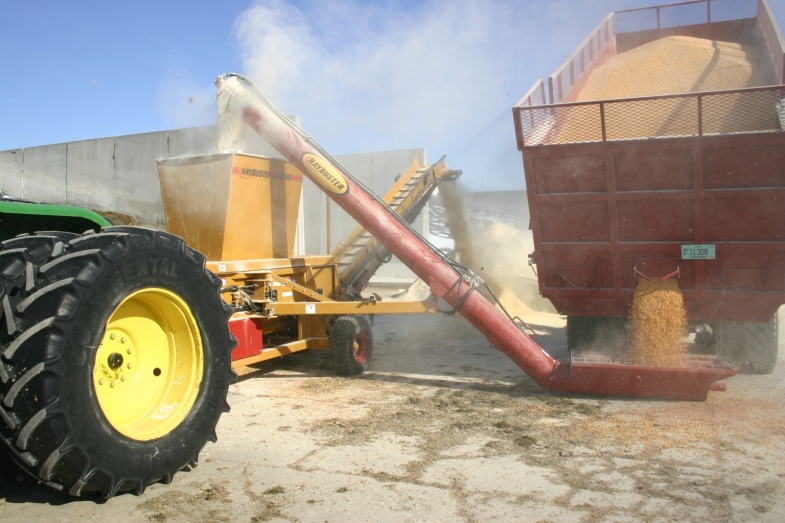 High-moisture grain being processed with a tub grinder (photo courtesy of Haybuster Inc.). While grinding may lead to faster ruminal fermentation and greater risk of acidosis, this problem is an issue only when feeding rations that contain greater than 50 percent HMC. With the increased feeding of wet distillers grains, the risk of acidosis from feeding ground high-moisture corn is greatly reduced due to the reduction in total ration starch content. Likewise, most dairies finely grind the high-moisture corn to facilitate greater ruminal digestion, and since grain is generally less than 50 percent of the diet, acidosis is generally not a problem. At moisture levels below 27 percent, water may need to be added to facilitate packing and fermentation. A good rule of thumb is to add 3.5 gallons of water per ton of corn for each percentage point the corn is below 27 percent moisture. This is the best option for large volumes of corn harvested in a short period of time but will require a large-volume roller or hammer mill to process grain rapidly. Packing is done with tractors, which may be equipped with a dozer blade or front-end loaders. During feedout, the face of the bunker must be kept fresh to avoid heating, so the width of the high-moisture corn bunker should match the rate of use. Multiple narrower bunkers may be more useful than one wide bunker silo. Bunkers constructed of a cement base and sides will reduce spoilage better than earthen structures and provide a firm surface for equipment throughout the year. Proper packing of the high-moisture corn in bunker silos also is critical to oxygen exclusion. Photo 3 shows a properly packed, covered and faced bunker silo filled with high-moisture corn. Proper packing, covering and facing will reduce spoilage losses and improve acceptability of the high-moisture corn in the feed bunk. Storing corn grain as high-moisture corn in a bunker silo (Greg Lardy, NDSU). A minimum density of 45 pounds of dry matter per cubic foot is desirable for good-quality high-moisture corn. Packing grain in bunker silos can be dangerous, so be sure an experienced and safe tractor operator is operating the packing equipment. Also, all bunker, trench and pile structures should be covered with plastic to create an anaerobic environment and minimize spoilage. Plastic covers should be inspected periodically and any holes or tears repaired. Photo 4 shows a large-capacity bagging machine filling a plastic silage bag with high-moisture grain. Bags are filled with a specialized bagger that also will process the corn to reduce oxygen inclusion as it stuffs the bag. Pressure can be varied to accommodate different feed products. Baggers are available for rent or purchase. Bags come in different sizes and lengths. A large-capacity bagger for placing feed ingredients in anaerobic storage (Greg Lardy, NDSU). Clear a flat space of rocks and debris, and make sure the space is large enough for equipment to move around to fill bags. Be sure to inspect bags and plastic bunker covers for tears or holes because oxygen penetration in these areas can cause additional spoilage. In addition, producers should monitor bags and bunkers for evidence of wildlife depredation and take necessary steps to reduce depredation and silage losses. Whole high-moisture grain may be stored in certain types of oxygen-limiting silos. One advantage of these structures is that corn can be stored at lower moisture levels (22 to 26 percent moisture) than in bunker or plastic bag storage structures. Check with the manufacturer to be sure your silo is designed to handle whole high-moisture grain prior to placing grain in the structure. Certain additives may be beneficial in reducing fermentation and feedout losses in HMC. Lactic acid bacteria inoculants that have been developed specifically for high-moisture corn should be considered when the corn has been frozen or is harvested below the optimal moisture content. The use of acid preservatives may be warranted if substantial ear mold damage has occurred and mycotoxin production is prevalent in the standing crop. When considering the use of an additive for high-moisture corn, be sure to ask the manufacturer for research data to support efficacy claims. The energy content of high-moisture corn is similar to dry-rolled corn (Table 1). However, high-moisture corn typically has higher ruminal and total tract digestion than dry-rolled corn. The higher ruminal digestion rate means producers need to pay particular attention to bunk management when feeding high-moisture corn. Table 1. Nutrient content of different corn harvest, storage or processing methods. Proper bunk management includes taking care to thoroughly mix all ingredients in the ration, including ionophores or other supplements; feeding at the same time each day; adjusting feed delivered to intake of the animals; and observing cattle for signs of acidosis or feed refusal.In addition, because of its moisture content, high-moisture corn isprone to more rapid deterioration in the bunk than dry-rolled grain. In addition, increased spoilage losses can occur during storage, especially during the summer, if the high-moisture grain is not properly packed, covered and managed. Research in Nebraska has documented advantages of feeding mixtures of high-moisture corn and dry-rolled corn in the finishing period. Other research has shown advantages of feeding mixtures of high-moisture corn and wet distillers grain during the finishing period as well. Immature corn may be harvested effectively as high-moisture corn for feed. Research at NDSU indicates light-test-weight, immature corn harvested and fed as high-moisture grain produced equal performance as mature corn grain in feedlot steers. Analyze grain for nutrient content to more accurately formulate rations because light-test-weight corn often contains more protein than heavy corn. When pricing corn, producers should take into account differences in moisture level, particularly with high-moisture corn. Dry corn typically is traded at 15.5 percent moisture. High-moisture corn can have moisture levels from 24 to 33 percent, which necessitates adjustment to a constant moisture level. For beef cattle and dairy producers, harvesting corn as high-moisture grain offers many advantages. Nutrient content and moisture of high-moisture corn may vary depending on harvest timing, yield, variety and other factors. To reduce storage and spoilage losses, proper processing and storage recommendations should be followed with particular attention to kernel processing, oxygen exclusion/proper packing and covering bunker silos to reduce spoilage. Take care when feeding high-moisture corn because it does have a faster ruminal digestion rate than dry corn. Consequently, better bunk management typically is required for successful feeding. This publication was authored by Greg Lardy, NDSU Animal Sciences Department Head, and Vern Anderson, former NDSU animal scientist.